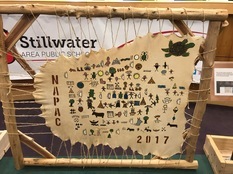 Members of the Native American Parent Advisory Council (NAPAC) presented the school board with a special gift at a recent meeting. Members of NAPAC are working with district students to teach cultural traditions and arts of indigenous people. Last year's activities culminated in the creation of a visual and virtual storybook, as well as a traditional calendar, a "Winter Count" style painting on tanned deer hide. The pieces were donated to the district and will be on display at Stillwater and Oak-Land Middle Schools. 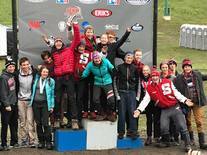 The Stillwater Area High School mountain bike team are state champions again! The team battled freezing temps and muddy conditions to win first place in the Minnesota State Division 1 Mountain Bike Championship race in Mankato last weekend. The Ponies also placed 1st in total points for the season to win the Overall Division I Team Championship! Stillwater Middle School was fourth among 60 school teams. The volleyball team is heading to state! The Ponies captured the 4AAA section title with a victory over North St. Paul. It's their second state tournament appearance and the first since 2009. See video highlights on Facebook. Congrats to the Stillwater boys' soccer team for its runner-up finish in the Class AA state tournament. The Ponies lost to Wayzata 2-0 in the championship game to finish the season with an 18-2-2 record. The boys and girls cross country teams competed in the state meet this weekend. The girls made their first appearance since 2005. The boys are no stranger to the competition having been there 20 times. This year marks the 20th anniversary of Stillwater's Magnificent 7, widely considered the greatest team in state history and one of the all-time greats nationwide. Watch the video. It's that time of year again when the temperatures drop and the snow flies. It's also the time when students start dreaming of snow days! The decision to close our schools is never made lightly. It is largely based on the ability of school buses to travel the roads safely and the conditions bus riders will face while waiting for the bus. Should a decision be made that will impact the school day, you will receive an automated phone message from the district as early as possible. School closing, delay or early dismissal information will be posted on our district and school websites, and on the district’s Facebook and Twitter feeds (search for Stillwater834). You can also listen and watch for an announcement on any of the local television stations or listen to WCCO radio to get the latest information on school closings. 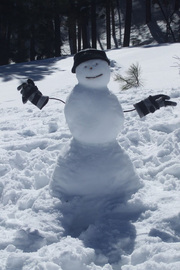 Learn more about school closing, delays and early releases online. Know someone who would love working for Stillwater schools? We're hiring for a variety of part-time positions - from food service to Community Ed staff and substitute positions. Most allow individuals to work when their children are in schools. No nights, no weekends, and no holidays. Learn more and apply online. The school board will have a special meeting on Thursday, November 9, at 5 p.m. at Stillwater City Hall for the purpose of a closed session for attorney‐client privilege to discuss pending litigation. See official notice.